Continuuity, a company that provides a big data platform as a service for developers, has raised $10 million in Series A funding led by Battery Ventures and Ignition Partners. Andreessen Horowitz, Data Collective and Amplify Partners also participated in the rounds. This brings the company’s total funding to $12.5 million. 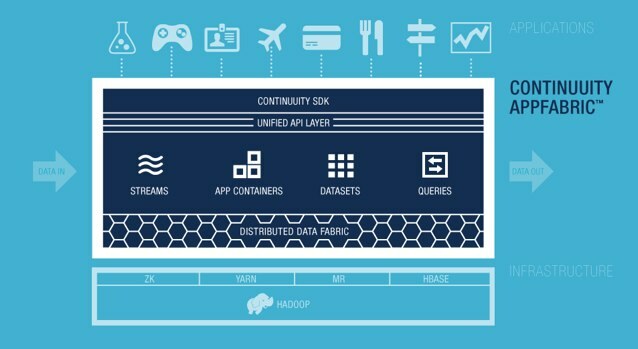 Co-founded by former Teradata, Yahoo, Facebook and Microsoft engineers, Continuuity recently emerged from stealth to debut its big data app hosting platform, called the AppFabric. This product uses Hadoop to allow developers to deploy, scale and manage big data apps in and outside the firewall. Todd Papaioannou, co-founder and CEO at Continuuity, tells us that the startup is trying to power the next wave of big data applications. He explains that the tools offered by Continuuity extend across the different parts and stages of building software, from using SDKs to developing apps using libraries. He adds that the company’s team members have extensive experience in dealing with Big Data infrastructures and applications at companies that pioneered the technology. Continuuity supports application development from prototype to production. The Continuuity Developer Suite includes a SDK, development tools and a fully-featured, single-node version of the Continuuity AppFabric to create and iterate on applications quickly. When ready, developers deploy applications with the click of a button – directly to a remote instance of the Continuuity AppFabric, which is available in an on-premise or managed private cloud edition, and in the future a public cloud edition. For example, the startup powers data mining for social e-commerce platform Payvment. “With the surge of Big Data over the past few years, it’s no surprise companies are striving to derive value from the ever growing amount of data. New kinds of Big Data applications that are able to pull meaning from data at scale will enable them to do this,” said Cameron Myhrvold, Founding Partner at Ignition Partners. “Continuuity is making it possible for the existing legions of competent developers to invent and deploy such apps. The company will use the funds towards product development and hiring.